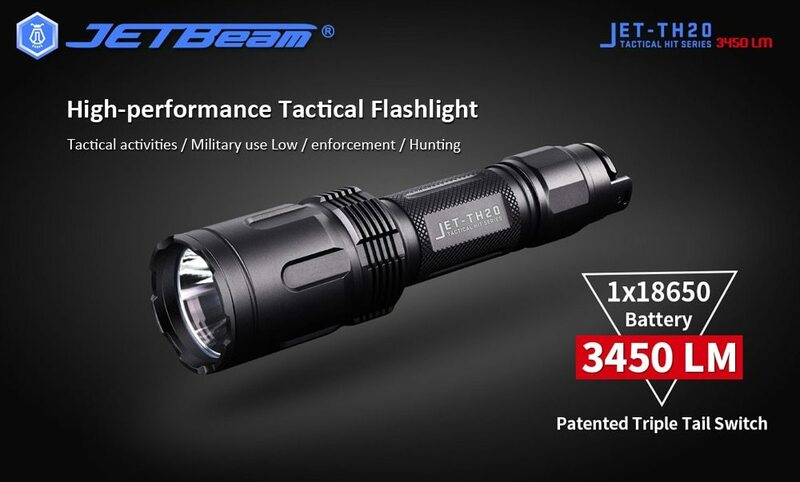 The Best Seller JETBeam TH20 Tactical Flashlight Review, News-JETBeam Electronic Technology Co.Ltd. With the release of JETBeam TH20 Tactical Flashlight， TH20 Tactical Flashlight is very popular with many customers. The Jetbeam TH20 Flashlight is a high-performance tactical flashlight with long run time,compatible with one common 18650 battery or two CR123A batteries. Equiped with the latest XHP70.2 LED, this is by far the brightest tactical light at its size. It measures 6 inches long and weighs 8 ounces, it is intended for one-handed use. The Jetbeam TH20 Flashlight features an innovative triple switch interface with ergonomic switch locations that allows for easy one-handed operation and rapid response. The tailcap features a traditional rubber push button switch for ON/OFF, and dual side metal tactical switches. It allows Momentary on by short pressing the tactical rubber switch and Momentary strobe by short pressing either of the side metal switches. One of the most important features of any good tactical luminaire is its ease of use, which can be crucial in the field. 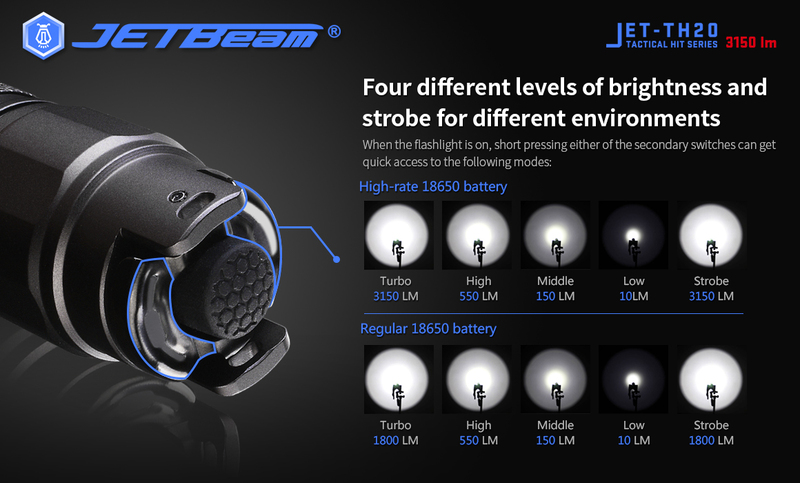 Fortunately, the Jetbeam TH20 LED flashlight has an innovative interface with a triple tailcap switch that allows easy one-handed operation with both hands. The tailgate has a single rubber push-button switch to turn the light on and off, and a pair of tactical metal switches located on either side of the rubber switch to switch through the numerous outlets of light, including a disorienting strobe for blinding attackers. The dual-metal switches allow you to effortlessly operate the light with both hands without having to readjust your grip. While the TH20 is turned off, its triple-switch interface can temporarily access either the last used output or the strobe function, giving the user full control.